Greetings! 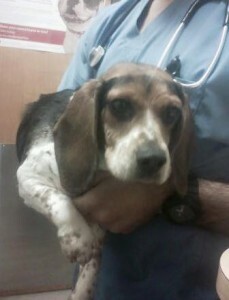 My name is Fancy free and I am a 3 year old beagle! I traveled all the way from Kentucky! I was initially found laying on the side of the road after being hit by a car. One look at me told the story, I had head injuries, scrapes, a long laceration on my shoulder and injuries to my pelvis. An animal control officer took me to a local shelter where I received initial care. When the staff realized the extent of my injuries, a desperate plea was sent to AFA/Lauren’s Wing begging for help. Arrangements were made for my transport to PA where I underwent more evaluations. Extensive surgery and plating was necessary to heal my multiple pelvic breaks. I once again was on the road, this time to Ohio State University. Lucky for me, one of the best surgeons was available to operate and after several days of post op care, I have returned to Action for Animals for some TLC and rehab. After I recover, I’m hoping my next trip will be to a wonderful home to a family who will love me! I send hugs and thanks to the loving staff at AFA and to everyone who supports the Lauren’s Wing Fund.